Responsible for the FBI’s Dive Team in Los Angeles, retiring in 2014 and moving to Rio De Janeiro, the host city of the next Summer Olympics, BOBBY CHACON said it was the CBS case in New York that was the game changer for the FBI Underwater Search Evidence Response Team [USERT]. Born in New York. CHACON entered the Bureau through the FBI’s New York Division–joining the dive team in 1995. 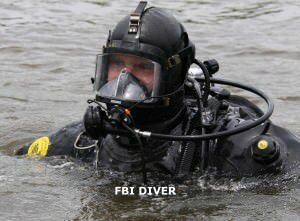 Becoming the team’s first full time diver and leader, he was instrumental in setting up protocols for the FBI Underwater Search Evidence Response Team [USERT] and establishing the FBI’s National Underwater Forensic Program. His experiences include being deployed as a diver to the 1996 Summer Olympics in Atlanta, the search and recovery effort of TWA Flight #800 and a 9-month TDY assignment to Athens to assist the Greece Government with the 2004 Summer Olympics. Reviewing 1982 news accounts of the CBS case CHACON talked about we learned searching the WACKAACK CREEK, a coastal tributary whose tide flows are influenced by New Jersey’s RARITAN BAY, an ad hoc FBI Underwater Search Evidence Response Team [USERT] made a very important discovery, buried in the brown mud, Bureau divers found two  spent .22cal shell casings. The FBI Underwater Search Evidence Response Team [USERT] had hoped to recover a silencer and a .22cal pistol used just days earlier to execute a woman and three  CBS employees, but finding the shell casings … agents thought they now had a suspect. Witnesses said the CBS technicians were killed when they stumbled on the crime, not realizing a woman had just been assaulted. Thinking they needed more evidence, agents targeted NASH using a multi-state Bureau surveillance team when he was arrested by the Kentucky State Police [KSP] driving the suspect van. Searching the van, agents recovered another .22cal shell casing which experts said also matched the .22cal shell casings found in the parking garage, CHIN’s abandoned vehicle and in the WACKAACK CREEK located behind NASH’s home in Keansburg, NJ by the FBI Underwater Search Evidence Response Team [USERT]. And executing a search warrant in the home of NASH’s nephew, THOMAS DUANE, police said they recovered another .22cal shell casing that likewise matched all the other shell casings, which experts said was fired from the same gun used in the four garage slayings and CHIN’s presumed homicide. Finding the aforementioned .22cal shell casings was a pivotal moment for agents looking to establish a full-time FBI Underwater Search Evidence Response Team [USERT], since it was first time the ad hoc FBI Underwater Search Evidence Response Team [USERT] was used to conduct a criminal investigation. Discovered in the WACKAACK CREEK, the .22cal shell casings bolstered evidence identifying NASH as the trigger-man in the slayings—making the case that agents needed an FBI Underwater Search Evidence Response Team [USERT] to collect evidence and conduct investigations. Before the MARGOLIES case [and the CBS murders], the ad hoc FBI Underwater Search Evidence Response Team [USERT] had only been used to assist agents conducting security and organized crime investigations—needing assistance conducting technical surveillance which generally was not discussed or disclosed in court. But with five  people being executed, including two federal witnesses and three bystanders, Bureau executives became convinced they needed an FBI Underwater Search Evidence Response Team [USERT], particularly when they realized—recovering evidence—agents needed protocols so they could work safely and effectively in a dangerous environment, whether it be in the deep ocean, a tidal swamp like the WACKAACK CREEK, or the dark murky waters of a deep river or lake.